I have really enjoyed my hair the past few weeks. It seems like the cold weather is doing me some good. My curls have been so juicy lately, and I’ve received a ton of compliments on it too. You know I had a few people ask how I get these curls poppin’. Here’s the secret – H20. Water is key to hydrated tresses no matter what time of year. Well here’s how I include it in my daily hair routine. Spritz hair with water. I use tap water because that’s what comes out of the shower. Some people like distilled water for their water bottle. It’s not that serious. My hair is curly so I have to stretch it a little to make sure the water seeps to the roots. Add leave-in conditioner/moisturizer. I saturate my hair with a good leave-in. The last few weeks I’ve used The Mane Choice 3 In 1 as my leave-in. As I mentioned in previous posts, it smells great. It’s water-based but creamy enough to make me feel like it won’t just evaporate. I use a good amount, maybe a quarter-sized amount per section. I take the opportunity to de-tangle my hair with my fingers. I don’t use combs and I only de-tangle my hair when it’s wet or damp. This seals the moisture in my hair and protects it for styling. Spritz hair again. I don’t need as much as the first time but I spray my entire head a second time. Oil scalp and hair. Right now I’m using a mixture of sweet almond oil, olive oil, and Jamaican black castor oil. I rub the oil from my roots to the ends of my hair after my scalp is anointed. I use about a quarter-sized amount for each section here too. Lightly spritz hair with H20 again. afterward, I shake my head a little this time to ensure the products are evenly applied. Add gel next. The oil that I added in the forth step primes my hair . I can’t stand crunchy curls. The oil ensures my hair stays soft . I coat my hair with the oil in sections from the roots to the ends to get the best definition. 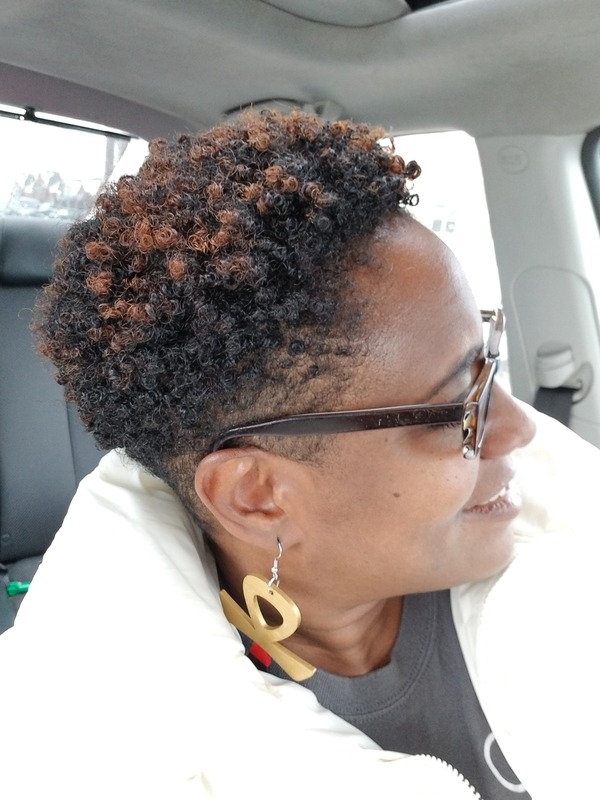 Right now I’m using The Mane Choice Egyptian 24-Karot Gold Glistening Twisting Gel or Biotin-Infused Styling Gel but I do the same thing with all of my gels. Spritz hair with water a final time and style. I spritz my hair with water again and shake it out. All that’s left is to style it. Styling it for me means making sure the curls fall evenly around my head. I like the halo effect. This is what works for me. I figured it out by trial and error. You may need to adjust the steps or the order in which you apply the product. Everybody’s hair is different. I use a bunch of water, even in the winter, because I have low porosity hair. My curls are tight and it takes a long time for moisture to soak in from the ends to the roots. Once the moisture is there, my hair is very manageable for a week. If it doesn’t have enough moisture, my curls get frizzy, look dry and nappy. It’s hard to de-tangle and will break of or the ends will split. Let me know what you’re doing with your hair in the comments. I’d love to hear what’s working and what’s not. You know I want to hear all about the products too. #productjunkie Until next time.